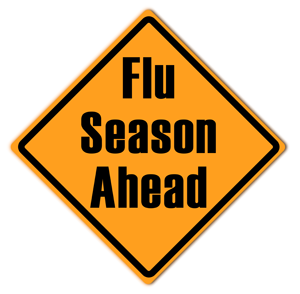 It is October which means influenza season is fast approaching. In fact, we have already had confirmed cases of influenza amongst our patients. Flu is transmitted primarily through respiratory droplets that can travel up to 10 feet with coughing and sneezing; and less far with talking. Flu can also be contracted with hand contact of a contaminated surface and then touching the face. According to the Centers for Disease Control (CDC) there are between 9 million and 35 million cases of flu annually leading to 140,000 -710,000 hospitalizations and 12,000 – 56,000 deaths. Given our current vaccination rates an estimated 5,000 lives are saved annually. The flu vaccine is formulated early in the year with strains that are felt likely to be circulating the next winter season. This is the reason the efficacy of the flu shot varies from year to year. Some years the experts are “right on”. In those years the shot is more protective but still not 100%. In years where strains not in the vaccine are prevalent the vaccine is less effective. Your best prevention against the flu is to get an annual vaccine. Now is a good time to do so since the virus is already present in our community. Avoid close contact with sick people. Even being near them can expose you to infected respiratory droplets when they are talking. When you are sick, limit your contact with others to avoid further spread of the virus. Cover your nose and mouth with a tissue when coughing and sneezing. Wash your hands with soap and warm water after coughing and sneezing and frequently throughout the day. Use hand sanitizer if soap and water are not available. Avoid becoming a flu statistic-get your vaccination now.